MINOR scuffles broke out as Harare municipal cops made good on a pledge to drive vendors from the capital's crowded sidewalks on Wednesday with the ZRP keeping a watching brief on the developments. By the end of the day, Mayor Bernard Manyenyeni was admitting defeat as most of the vendors simply returned to their spots once the cops moved to clean up another section of the city. Most of the informal traders defiantly vowed they would remain put and warned the ruling Zanu PF party that it would get its comeuppance at the next general elections in 2018. It was the first day of a clean-up drive that will continue until vendors move into permitted areas, said Michael Chideme, Harare city council spokesman. "Sanity has to return to Harare but vendors have to go first for that to happen," said Chideme. "It is a process, so we don't expect to remove all of them overnight because they are too many." Some of the vendors held up placards as they were removed and threatened to take revenge in the next general election, with one vendor carrying a cardboard box with the message "Let's meet 2018 elections" written in thick black letters. Many vendors in the city centre continued to do business while police targeted other areas. Mayor Manyenyeni said he would have a word with new local government minister saviour Kasukuwere after conceding defeat. “I would want to see the minister after I meet officials on the ground so that we can present to him what we think are our shortcomings inasmuch as the relocation of the vendors is concerned,” he said. 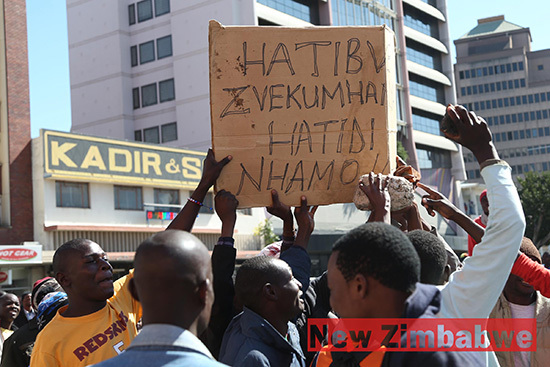 With little chance of formal employment in a struggling economy, vendors vowed to stay put until the country can produce jobs, said the National Vendors Union of Zimbabwe. Last month vendors asked the government to stop the evictions but Local Government Minister Saviour Kasukuwere told city councils to proceed with the operation. At first, the government threatened to use army troops to evict the vendors, but a court ruled against the use of force. The city council said it has space for 6,000 vendors but about 20,000 are operating within the central business district. At least two thirds of Zimbabweans are engaged in informal trade due to a debilitating economic meltdown, African Development Bank estimates. Once regarded as one of Africa's cleanest cities, Harare is now a sea of vendors who clog sidewalks with wares of all sorts — clothing, fruits and vegetables, food, cosmetics — even car parts and medicine.